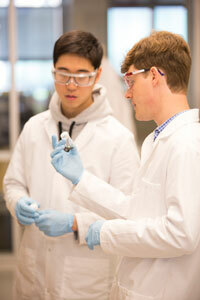 The UW Department of Chemical Engineering offers degrees of Doctor of Philosophy (Ph.D.), Master of Science in Chemical Engineering, and Master of Science in Engineering. Graduate students study and collaborate with members of the faculty in an atmosphere more informal and intellectually vigorous than is usually found in undergraduate work. The range of interests among the faculty members is broad, so students have access to a variety of fields while receiving individual attention and guidance. Description of the Ph.D. degree, requirements, and advantages to earning a degree at UW. Description of the M.S. Program, requirements, and areas of specialization. Step-by-step guidelines for applying, including the information required for application to Department and University and deadlines to apply. Information on ways to subsidize education and housing options for graduate students. Find answers to the most commonly-asked questions of prospective graduate students. Chemical Engineering students share what it's like to be a UW ChemE.